The VOR Academy is set to welcome two groups of Chinese youth sailors this weekend in Sanya. 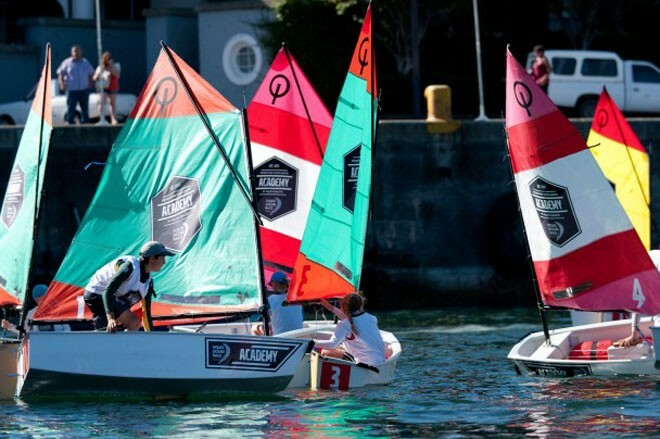 The first visiting squad is made up of four teams of Optimist dinghy sailors who have travelled from the National Training Centre in Haikou to take part in the Team Racing Clinic starting February 10 and running through to February 12. All experienced sailors who have all competed at a national level within China, this group will take part in three days of intensive training and competition to develop their team racing knowledge and skills, under the guidance of Academy coaches Chris Atkins (GBR) and Bill O’Hara (IRL) – both ISAF International Umpires. On the water training started on Friday afternoon, to be followed by practice racing on Saturday and a knockout team racing tournament on Sunday. The grand final is scheduled for 1500 local time (0800 UTC) with a prize giving around one hour later at the Volvo Pavilion in the race village. Racing will take place outside the marina and spectators will be able to watch from the sea wall. The second group of sailors is made up of children from Serenity Coast aged from seven to 16 and new to the sport of sailing. During their two-day visit to the Academy the children will learn to sail in the Volvo Ocean Race’s travelling fleet of Ludic dinghies, under the guidance of Chinese coaches. As well as experiencing the thrills of sailing for the first time, the newbie sailors will also be given a VIP tour of the race village, including back stage access to the team areas. The group’s weekend of fun will culminate in some close quarter racing (with a twist) on Sunday afternoon before the new sailors join the Optimist squad in the Volvo Pavilion for a joint prize giving. An additional key element of the Academy to help with the development of local coaches and race officials around the world to ensure that the programme leaves behind a lasting legacy after each of the stopovers. In Sanya, four participants are registered on an official ISAF Umpire Clinic which will run over the weekend, in parallel with the youth training and regatta. Subject to the availability of sufficient Chinese coaches, during the second week of the stopover the Academy also hopes to be able to operate its popular Try Sailing initiative to give local school groups and the general public a chance to get afloat for the first time.